Embuilt Technologies has developed a complete system to test Single Phase Devices and power supplies (AC-DC) such as LED Driver, SMPS, CFL, Lamp etc. It can be used for production testing or R&D of these products. SMART-QC which is used for basic AC-DC testing. To select, there is selector switch (feature 11).Position the switch to the manual side. In manual testing user can test the testing model at different voltage levels by using Variac Knob (Feature 12). Readings are shown on SPEA-1 and SMART-QC display. Variable DC Loads (Feature 9) can be selected using switching controller. Various types of test can be done using this system. PCB test – To test pcb is working correctly and there is no short circuit. MCB will off on short circuit. Voltage range test – Testing on specified voltage range (Low and High). AC load test – Test the performance on load. AC Simulation – Test all parameters of AC side. DC Load test – Test the power supplies at different loads. 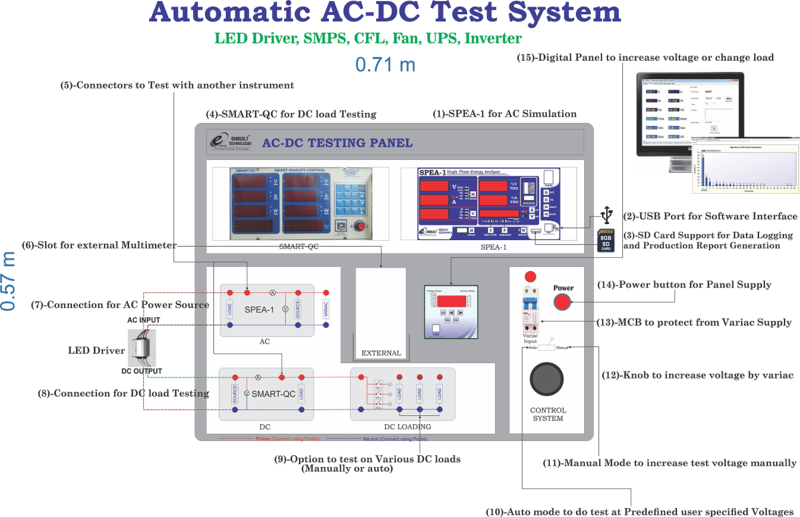 DC Efficiency test – Test the efficiency of AC-DC Converters. 1- SPEA-1 is AC Power Analyzer with Harmonics Measurement. It analyzes the AC power. It measures and tests all parameters with Harmonics. It also takes data from SMART-QC and show on its display and also on software. 2-SPEA-1 has USB port for software interface. SPEA-1 connects with Computer/Laptop using USB port. Software has real time data monitoring with alarm feature. It also generates Production report. 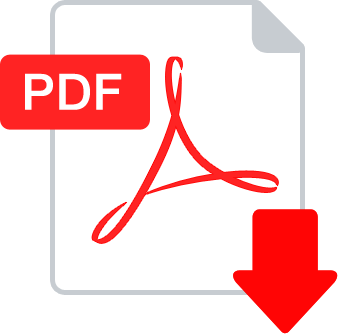 It analyzes the AC power with harmonics spectrum and generates the PDF Report. When RS-485 is enable it also shows SMART-QC Data and generates complete report. 3- SPEA-1 also support SD Card. Using this user can generates production report with model name and serial number. It also used for data logging with model name. So it removes the need of computer on the testing table. By this it saves the unnecessary space. 4- SMART-QC is used for DC Testing. It tests basic AC-DC parameters with efficiency. 5- Connectors are given such as user can use another test instrument to measure voltage and current. 6- A slot is provided to hang the multimeter. This can be used for calibration purpose. 7- User has to connect the AC side of test model as given. Solid lines represent the connections are internally done. Dotted lines shows user has to connect using probes. 9- Additional connectors are given at DC Load sides. 10- User can change voltage using variac. Variac works on two modes -Auto and Manual. In auto mode user has to press “Auto” button on the switching controller. The Voltage will change according to the values set by user. User can also user switching controllers “UP” and “Down” Button to change voltage levels. 11- When in manual mode, User can change voltage by rotating variac knob. 12- Smooth Variac knob is provided, so that user can change voltage with a constant rate. 13- Variac output is connected to MCB, so that if any fault occurs on testing it will protect from damage. 14- A power button is provided to ON/OFF the whole system power supply. Please leave comments for feedback and details.